Some say that there’s been a shift with the coming of the New Millennium and that the Andes has become the Spiritual Epicenter of the planet. Peru is certainly more accessible than the far-away Himalayas and a lot less freezing. I was in the Incan Region exactly five years ago, and without even planning this coincidental timing, here I go again! My blissful five months in Uruguay are coming to an end and I’m now working hard to book my air tickets to Cusco, Peru, where I’ll stay a week or two, exploring the history of the Incan Empire, before taxiing for an hour to Pisac, Peru. 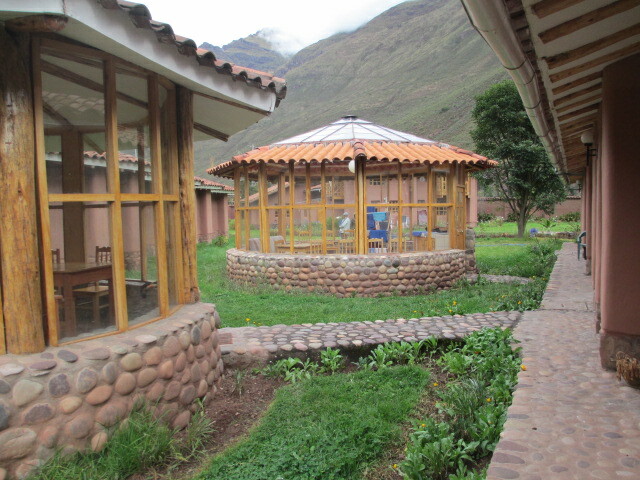 I’m already booked for a month’s stay (May 14 to June 14) at the beautiful Paz y Luz (Peace & Light) Bed and Breakfast Healing Center. 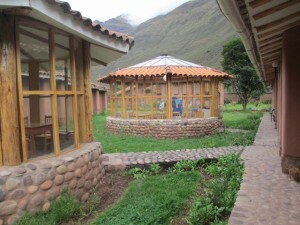 Take a look at www.pazyluzperu.com, to see this lovely, spiritual meditation training center where I will stay in a private room for under $700 per month, basking in the mountain beauty and taking part in yoga and many other forms of spiritual training and exploration. I look forward to participating in an Ayahuasca Ceremony, as I did five years ago, when I spent a week at this same center in March, 2009. Two blogs back, I introduced you to my friend, George Burdeau, whom I met here in Montevideo, Uruguay. As a movie and television producer, he suggested that my life would make an interesting Reality TV show and, before he flew home, we filmed a Sizzle Reel audition tape to present to network officials in June, when new show ideas are presented. If the plan is accepted, my “reality” could change considerably…though it would also stay the same, as I would simply be filmed traveling the world, solo, living in hostels and finding adventure along the way. So, the word, “REALITY” is meaning much more to me than it used to….as you might well imagine. Voila! Here it is, shown to me in my Ayahuasca Vision, THE SECRET OF REALITY, five years ago, at the very spot where I am heading next! How cool is that? Spooky Cool, in my book! “Right now, I need to catch up on journaling my Vision Quest experience of the Ayahuasca Ceremony, as well as to capture the wonderful meeting of the minds which Gray, Dana, and I had last night when I described my Spinal Column Analogy to them. Boy, was I zinging all last night with the spiritual energy that our brainstorming produced! Couldn`t fall asleep for hours. Being in this pregnant place is bringing so many new understandings to light and sleep was elusive because my Upper Ones were so excited about the positive input and reaction of these two beautiful and spiritual souls. I have had so few opportunities to share this material with anyone at all and here, in Paz y Luz, there is promise that I might find many such chances. The thought occurred to me (mistakenly, as it turned out) that these creatures were reaching out to find God and were surely supplicating to a Greater Being. I also compared them to people who might stick their bodies out of a train window and wave vigorously in the air, but who were firmly planted inside of the moving train with no intention or practical reason to follow their hands in a complete departure from the train. Because I’m no stranger to significant visions, I have trained myself to participate by keeping a running, memorized journal entry going on inside of my head. Not only to discover a bit of logic or a message or purpose, but to keep up with the sequence for later recording. I now asked myself if perhaps I had been in the lower levels previously and the polyp people might represent bacteria or some other minute inhabitants of creation. Was I now entering the animal kingdom and would I be shown the human level next? These golden cats proved to be pumas, an animal sacred here in Peru, and surely sacred to our shaman. Were they telling me something with their many faces sending penetrating stares directly to my eyes? Was this another Greek Chorus prefacing my next vision? My mind also wondered about the many rectangular, over-decorated, individualistic houses. They reminded me of the mud brick block towns in Peru which I have passed so often on the bus. No matter how gaudy or how plain, there was an atmosphere of sadness about them, just as those actual mud towns on the garbage dumps had seemed to feel. Then, as I overflew these dimensions of living, I began to repeat not only “I no longer wish to be here!” but an added, heartfelt statement: “I no longer wish to be within Reality.” Don´t worry . That was definitely not a suicidal thought, but I really did sincerely mean it, at the same time. Still do and always will. Think about the context. The underlying truth of all existence is that Happiness is not to be found within Reality. I already knew this and have always looked forward to the day when I am invited to wing my way out of the Physical Realm and attain the Plane where True Happiness does exist. In the meantime, I am perfectly content to continue my examination of this fascinating world which surrounds me at this present moment. So now, in May, 2014, I return for a month to this wonderfully spiritual setting, not sure of what my future…. my new Reality…. will hold; but looking forward to all the promise that it potentially has. I can say, categorically, that I really do adore my life and where it has led me, so far. I can’t wait to see what “Reality” is waiting, right around the bend. If this is only a muted version of what is to come in the Next World, then I can only repeat……”Wow! How Cool is that?” Because, this life just keeps on getting better and better!